Depending on your point of view, tax season can be either an exciting time of year or a stressful one. It’s exciting because there’s the potential for getting some money back from the government. By the middle of February 2015, the Internal Revenue Service had issued around 40 million refunds out of 50 million filed tax returns. The average return had a refund of more than $3,000. On the other hand, tax season can be a stressful time because a lot of preparation and planning is involved in getting your return filed. The critical thing to do is not procrastinate. The sooner you file your return, the sooner you’ll receive any refund amount — or the sooner you’ll know whether you owe additional taxes. Here’s what to know when filling out your taxes this year. You might know that April 15 is “tax day,” the last day on which tax returns can be postmarked or sent online without being considered late. But April 15 isn’t always tax day. If the 15th happens to be on a holiday, Saturday or Sunday, the day taxes are due gets pushed to April 17. Washington, D.C. celebrates Emancipation Day on April 16, so taxes aren’t due then. Since April 15 is a Sunday in 2018, and the 16th is a holiday, the last day to file tax returns for 2017 without filing an extension is Tuesday, April 17. If you suspect you won’t have your tax return ready by the April due date, it is possible to request an extension. To do so, you’ll need to complete and submit Form 4868. The extension pushes the due date of your tax return to October. The key thing to know is that the extension only applies to the time you have to file your return — the IRS still expects to receive any money you owe by the April due date. If you end up owing tax and you file late with an extension, you might end up owing interest on top of the original amount due. If you don’t ask for an extension and file late, you can expect to pay a late filing fee. The fee is typically 5 percent of the amount you owe, per month, that the return is late — it’s capped at 25 percent. The IRS won’t withhold additional money from you if you are due a refund and file late. You’ll still get the money the government owes you back, as long as you file your tax return within three years of the filing year. For example, 2018 is the last year you can claim a refund from 2014 returns, which should have been filed in 2015. Once you’ve got the due date marked down and have decided whether you can file on time or need an extension, it’s time to start gathering all the forms and documents you’ll need to complete your return. You should have received some documents, either by mail or electronically, at the beginning of the year. Others, such as receipts, you should have had from the start. Income documents include form W-2 from your employer, as well as certain types of 1099s and forms that report any interest or dividend earnings you had for the year. If you are self-employed or have any freelancing projects, you will most likely receive Form 1099-MISC from companies that paid you more than $600 over the course of the year. Keep in mind, just because a company doesn’t send you a 1099-MISC doesn’t mean you don’t have to report that income to the IRS. Since not every business you work with will send 1099s at the beginning of the year, if you are a freelancer or run your own business, it’s important to keep some record of all your income throughout the year. If you have a retirement plan, you might receive a form from the plan provider. For example, if you rolled over money from one account to another during the year or took a distribution, the plan will send you Form 1099-R. If you contributed to an IRA, you’re likely to receive Form 5498. Because of the Affordable Care Act, you are likely to receive Form 1095-A, 1095-B or 1095-C, depending on the type of coverage you had. Depending on the specifics of your financial situation, you might receive several other tax documents you’ll need to complete your tax return. For example, if you are currently repaying a student loan, your loan servicer will send you Form 1098-E, which lists the amount of interest you paid over the year. If you have a mortgage, your lender should send you Form 1098-T, which lists the amount of interest you paid on the loan. At this point in the process, you might be wondering if you need to file a tax return for the year. The answer depends on your income and whether or not you expect a refund. For 2017, if you are single, have no dependents and earned less than $10,400 — the amount of the $6,350 standard deduction plus the $4,050 personal exemption – you can skip filing a return, as you won’t owe any tax to the IRS. However, if you made less than $10,400, paid tax during the year and want the IRS to refund that money to you, you’ll need to file. The IRS has a wizard that can help you determine whether you should file or not. Itemize or Claim the Standard Deduction? As you get ready to file your tax return, one thing to think about is whether you’ll itemize your deductions or claim the standard deduction. If you itemize, you’ll need to have receipts for the expenses you plan on including, as well as any relevant tax forms — such as the 1098-T for mortgage interest. The next step when preparing for tax day is deciding how you will file your taxes. 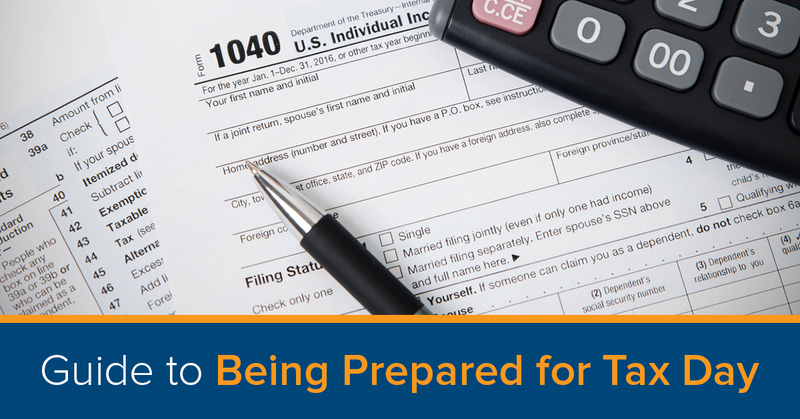 For 2017, you have several options when it comes to preparing and filing your tax return. If filing a tax return is completely new to you, or if you’ve had a big change in your employment status or personal finances over the past year, it might be particularly useful to work with a professional tax preparer. A tax preparer can also be helpful if you are self-employed or have a tax return that is complicated for any reason. A tax preparer has met specific guidelines, but often won’t necessarily have gone to college for accounting or taxation. An enrolled agent is someone with a license from the IRS. Enrolled agents also need to take and pass continuing education credits. Accountants or CPAs have typically gone to college for accounting. CPAs have also passed exams and are required to take continuing education courses. Tax attorneys have gone to law school, passed the bar and are licensed by their states. If you decide not to work with a tax professional, you have a few options for filing your return on your own. One option is to use tax filing software, which guides you step by step through the process and does the math for you. One benefit of tax filing software is that it will ask you specific questions about your finances or household to determine if you are eligible for certain deductions or tax credits. When it comes to features and complexity, tax filing software runs the gamut. Some programs will handle the simplest of tax returns, while others are specifically designed for self-employed individuals or small business owners. Tax filing software also varies in price. Under the IRS’ Free File program, you can choose from a variety of software programs and file for free, as long as you earn less than $66,000. If you earn more than that, you usually have to pay to use a software program, although there are a few that are free to people of all incomes. A third option for filing your tax return is to complete the forms yourself. Although paper tax returns have mostly gone the way of the dinosaur, it is still an option if you want to do the math on your own and handwrite your figures. A more modern way to fill in your tax forms yourself is to use the IRS’ Free Fillable Forms site. Like tax software programs, fillable forms do the math for you. They also submit your return electronically, which can speed up the time between submission and getting your refund. The drawback of doing your own tax return is that you need to be aware of all the deductions you are eligible for, as well as each form you need to complete. Fillable forms — and paper forms, for that matter — won’t prompt you or ask you specific questions to make sure you haven’t missed a deduction or overlooked filing a critical form. Once it’s time to complete your tax return, what types of forms can you expect to file? It all depends on your finances and income sources. Here are a few of the more commonly filed tax forms. Form 1040: The primary tax form used to list your income and deductions, as well as the tax you owe. Form 1040A: A simpler version of Form 1040. You can use it if you don’t itemize deductions and don’t have business income. Form 1040EZ: The simplest version of Form 1040. The only people who can use this form are those who don’t have dependents and who have no extra deductions. Schedule A: The form you use if you itemize your deductions. Schedule B: The form you use if you have interest or dividend earnings over $1,500. Schedule C:The form you use if you have business income or are self-employed. Schedule D: The form you use to report any capital gains or losses if you’ve sold investments over the year. Schedule SE: The form you use if you’re self-employed to calculate your self-employment tax. While preparing to file your federal tax return, don’t forget about state and local returns, as well. In Pennsylvania, you may be able to file your tax return for free using the PA Free File system. Pennsylvania also offers PADirectFile, which lets you file your return directly with the state’s department of revenue, for free. The sooner you get your tax return filed, the sooner you’ll receive your refund. Filing early also gives you plenty of time to review your return and make sure you have everything in order before you hit submit.